NASA launched a pair of compact spacecraft tonight that will use the moon's gravity to whip them into orbital positions ahead of and behind the Earth to study titanic solar eruptions in three dimensions. The goals of the $550 million STEREO project are to figure out what triggers the enormous blasts, how electrically charged particles from the sun's atmosphere move through space and how they interact with Earth's magnetic field. Large coronal mass ejections, which can blast 10 billion tons of the sun's atmosphere into space at speeds of 1 million mph or more, can damage satellites, threaten astronauts, disrupt communications and cause problems with electric utility power grids. One of the objectives of the STEREO mission is to improve forecasting and provide more lead time between a CME and its possible effects on Earth. Coronal mass ejections, or CMEs, are "explosions caused by the annihilation of magnetic fields, they throw a lot of material out into space," said project scientist Mike Kaiser. "Sometimes, this is directed towards Earth and can actually slam into Earth and force Earth's magnetic field back and release a lot of energetic particles. These particles can cause the northern lights. But they can also cause electrical damage to spacecraft in orbit or even to ground power systems and conceivably even astronauts, if they were exposed to radiation from one of these storms." A suite of satellites and ground-based instruments monitor the sun on the a daily basis and and a steady stream of data, pictures and movies from the Solar and Heliospheric Observatory, or SOHO, spacecraft, provides dramatic views of CMEs erupting in the sun's atmosphere. So why did NASA spend $550 million to build and launch the twin STEREO spacecraft? "The answer is, the particular CMEs we're interested in are the ones coming directly at us, like somebody blowing a smoke ring at you," Kaiser said. "If you're trying to determine how fast is that smoke ring moving towards you, all you're going to see is this expanding ring. An easier way to do it would be to have two viewers off to the sides of that smoke ring and triangulating how fast it's moving. "That's exactly what we're trying to do with STEREO," he said. "We're going to put two spacecraft off to the side and triangulate, in three dimensions, to look at these coronal mass ejections. We're hoping in that way, we'll be able to give much better predictions of when they're going to arrive at Earth and the exact direction they're moving. That's very hard to do when you're looking directly at the sun." Running 14 minutes late because of weather-related range safety issues, the flight got underway at 8:52 p.m. today with a spectacular night launch of a Boeing Delta 2 rocket carrying both STEREO spacecraft in its nose cone, one atop the other. 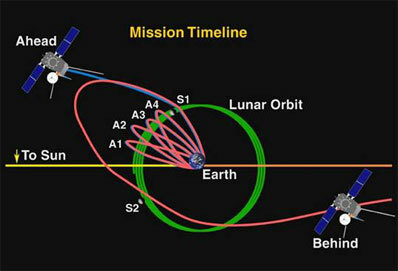 Twenty-five minutes later, after two second-stage rocket firings and a final push by a solid-fuel third stage motor, the twin spacecraft were released into an orbit carrying them around the Earth and moon. 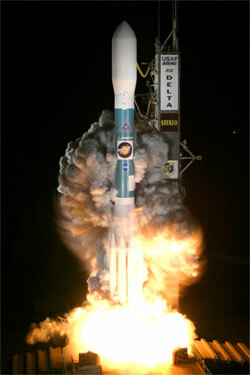 It was the 69th success in a row for the Delta 2 program and the 122nd success in the past 124 flights. If all goes well, both STEREO spacecraft will sail past the moon Dec. 15, one flying by at an altitude of 3,689 miles and the other at 6,677 miles. The moon's gravity will fling the lower-altitude spacecraft, appropriately known as AHEAD, into an orbit around the sun that will allow it to pull out ahead of Earth in its orbit. The other spacecraft will fly past the moon with its twin before falling back for another flyby Jan. 21, sailing 9,960 miles above the lunar surface. The January flyby is designed to fling the BEHIND spacecraft into an orbit trailing the Earth. Checkout and calibration of the twin spacecraft should be complete by the end of January, kicking off a planned two-year science mission, but project managers expect to begin collecting data before then if no problems develop. STEREO stands for Solar Terrestrial Relations Observatory. Managed by NASA's Goddard Space Flight Center, the solar-powered STEREO spacecraft were designed and built by the Johns Hopkins University Applied Physics Laboratory. The two 1,400-pound spacecraft are each equipped with near-identical suites of remote sensing instruments to study coronal mass ejections in three dimensions. Another suite of instruments on each spacecraft will measure the solar wind, the interplanetary magnetic field and other energetic particles. Two other instruments will study radio disturbances and the coupling of the solar wind with the sun's outer atmosphere. The solar cycle waxes and wanes over an 11-year period. At present, near the minimum of that cycle, CMEs occur once every day or so. 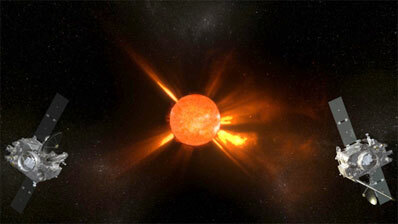 At maximum, as many as eight CMEs can erupt per day. With the five-telescope imaging suite aboard each STEREO spacecraft, "we're going to be able to observe CMEs from their origin at the sun all the way to Earth," said principle investigator Russell Howard. "That will be the first time we've ever seen that. It'll be truly remarkable."